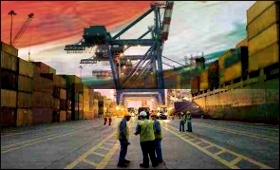 The Merchandise Exports from India Scheme (MEIS) is being redesigned to make exports from India compliant with the proposed Goods and Services Tax (GST), a senior official said on Wednesday. "While manufacturing and trading activities at present times have a strong taxation orientation and the cost of logistics is high vis-a-vis the mature markets, adoption of GST will reduce the cost of production and distribution," Additional Commissioner, GST Cell, Central Board of Excise and Customs (CBEC) Neeraj Prasad said while addressing industry chamber Ficci's executive committee meeting here. Under the MEIS, the government provides duty benefits to several products at 2 percent, 3 percent and 5 percent depending upon product and destination country. Prasad also said that GST would help build competitive advantage by leveraging the supply chain. Technology in logistics, such as the use of advanced telematics, real-time vehicle tracking and route planning are likely to help execute operations in an efficient and seamless manner, he added.